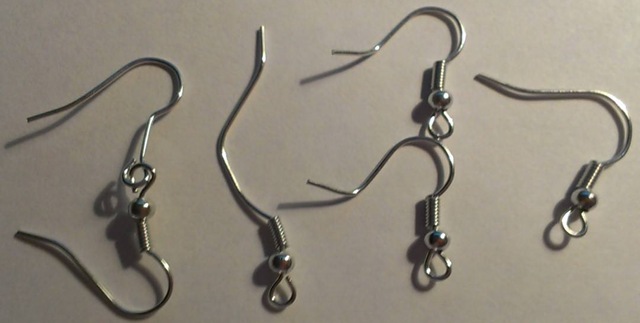 I ordered these “Hypoallergenic” Surgical Steel Ball & Coil Earring Hooks (X100) from Amazon on July 3rd, 2013. When I bought them, I didn’t realize they were coming from China. If I had known that, I wouldn’t have bought them. In fact, I tried to cancel my order right away, but they wouldn’t let me. I was able to click the link to cancel, but the drop down menu for the reason for returning didn’t have any options, so without a reason to choose from, it was impossible to cancel. My other reason for wanting to cancel was because of the reviews saying these aren’t actually hypoallergenic which I did not read until after I bought them. So what I did on July 4th was I went to Michael’s and bought some hooks because I was so excited about making earrings and I wanted to buy the hooks because the sooner I could make them, the sooner I could sell them. But I found out that they weren’t actually hypoallergenic. I wore a pair for a couple of days to test them out and my right ear lobe started to get infected. I decided to just keep making earrings and when I finally got some hypoallergenic hooks from Etsy, I took all the Michael’s hooks out and replaced them with hypoallergenic hooks. The earrings in the image above are the Michael’s earrings on the left and the “hypoallergenic” surgical steel ball & coil earrings from Uncommon Artistry on the right. When you are looking at the 2 bags next to each other, you can tell there is a huge difference in the colors. The Michael’s is like a silver, while the Uncommon Artistry is more of a gray or like a blue gray color. They actually look exactly alike in the image above with the exception of the curvature of the 2 earrings. I am testing a pair out on my own ears just like I tested the Michael’s earrings because before I write a review on Amazon, I want to make absolutely sure they are hypoallergenic. If they aren’t then I can say that they aren’t, but if they are then I can say they are. If they are hypoallergenic then I can use them and say without a shadow of a doubt in my description that they are indeed hypoallergenic. Otherwise, I have to note that they aren’t and indeed mention that if you have allergies, don’t buy these, buy the hypoallergenic ones. So I’ve only been wearing them for like a minute and my right ear is already starting to pulse lol. It’s like I can feel my heartbeat in my ear lobe. I’m not quite sure if my ear is still recovering from the infection from the Michael’s earrings. I haven’t worn anything in my ears for weeks, or since that first test that I did. I started wearing plastic earrings in those holes yesterday. When I put the plastic earrings in yesterday, both ears were a bit sore and they were hard to put in at first because I think the holes started closing up or perhaps they were closing because of the (for the lack of a better word) infection juices were causing the holes to close. LOL I didn’t know how else to say that. Anyway, I had to clean my ears yesterday because the earring was a little red from forcing it through the back. They are still sore, so if something is going to happen, it’s probably going to happen fast. Quality: I have been reading the reviews and more than a few said there were some that were bent and the coil and ball were missing or whatever. Well, I was curious to see if there were any like that and as I was putting the normal ones back in the bag, I was counting them. I counted 112 hooks and there were only supposed to be 100. But, I think that makes up for the fact that 4 earrings were bent, well, 1 of those wasn’t too badly bent, but well, you see in the picture. And 2 of them were hooked together and as you can see 1 is missing the ball and coil. I think I can deal with the loss of 4 earrings and I can unhook those 2 good ones and replace the ball and coil from one of the bad ones. I still come out on top with 108 good hooks, well 2 of which I am wearing for testing that I cannot actually sell, so 106 good hooks lol. Update 8:39 p.m.: I had to take them out. I’m in agony right now. My head feels tight and my jaw is in a lot of pain, more pain on the right, but in pain on both sides. These are worse than the Michael’s earrings lol. At least with the Michael’s earrings I was able to wear them for 40 hours, I couldn’t wear these for more than 6 1/2 hours. Heck, I was ready to take them out after the first minute because the pain started immediately. I will not be using these earrings, not even for people who don’t have allergies. These are going in the trash. At least it was only $2.32. Next time I will make sure I read the reviews first.